No. 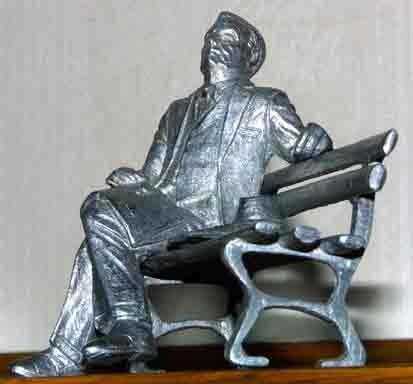 75 of "The Statesman," a pewter sculpture of Nebraska Sen. George W. Norris (1861-1944), is reserved for the Tennessee Valley Authority. The "TVA" was created, with Sen. Norris's sponsorship, on May 18, 1933, to oversee the construction of dams to control flooding, improve navigation, protect natural resources and create inexpensive electric power in the Tennessee Valley basin. The TVA today is the largest public power company in the United States. Sculptors Gary Ginther of rural Cambridge and and Jon Leitner of Cambridge have created a life-size bronze of Norris that will be placed on the front lawn at Norris's home in McCook (706 Norris) and dedicated -- during McCook's annual Heritage Days celebrations -- at noon, Saturday, Sept. 29. Miniatures of "The Statesman" are being sold for $125 each, to fund the production of the life-size bronze. Duane Tappe of McCook, site supervisor of the Norris House, said No. 75 of the miniature sculptures has been reserved for the TVA to commemorate its upcoming 75th anniversary. TVA has also purchased 20 of the miniatures -- "Little Georges," that's what Tappe calls them -- for $2,500. Tappe said there are 58 "Little Georges" left, and hopes to sell them by or on the day of the dedication of the life-size bronze. I received my "little George" today and am extremely impressed with the detail. Gary and Jon are to be commended. The sculpture is wonderful and I do hope that they are all sold out soon. It's great that Sen. Norris's '37 Buick is in running condition too. What a great effort by Duane, Chris and Galen!